The last two baked goods that came out of my kitchen were substandard, for sure. Not enough flavor, heavy, arduous texture, and especially disappointing because one came right on the heels of the other. But today things turned around at last, courtesy of these lovely. 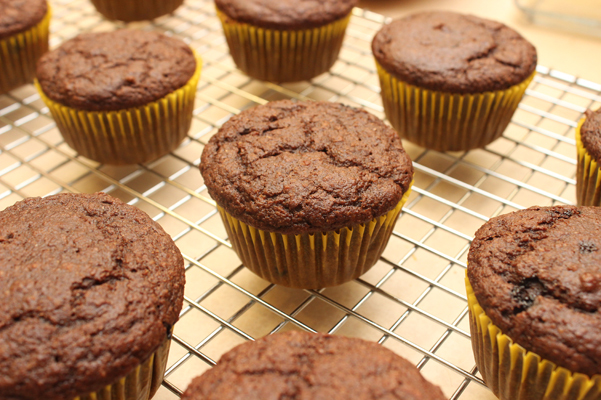 fluffy, flavor-filled orange mocha muffins. The most fascinating thing about them is that they reached their peak of perfection two days after baking. I liked them well enough before that, but on the second day after baking something changed and the flavors suddenly came together, merging into a new level of perfection. Instead of tasting the espresso and then the orange, I could taste both flavors together in harmony. Tracy, a co-worker and connoisseur of my steady stream of baked goods , felt the same way. 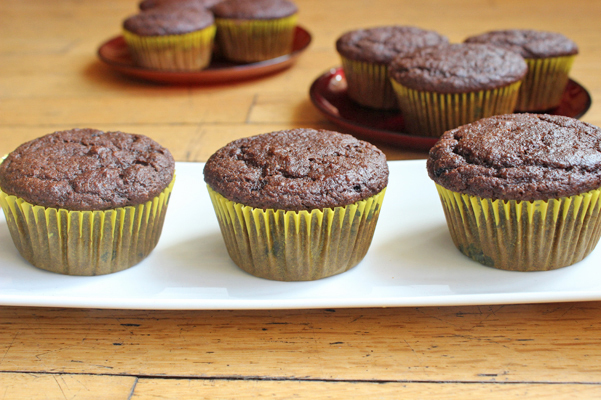 Something magic happens to these muffins two days in. But let’s go back in time for a moment. It’s two days earlier, and I’m zesting an orange. Two teaspoons of it. Okay, that was more than two teaspoons. Just a little bit more. 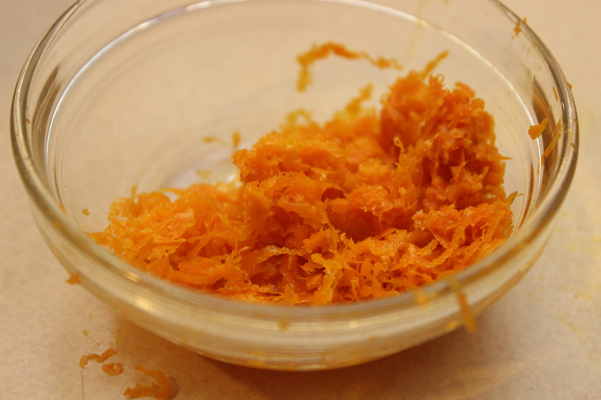 Next, the dry ingredients. 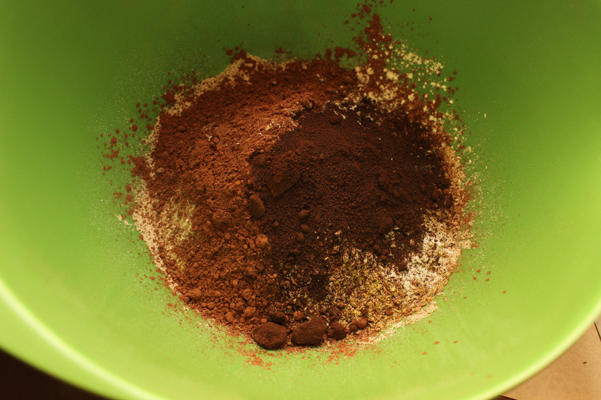 Whole wheat white flour, toasted wheat germ, ground flax, baking powder, baking soda, and espresso powder. No salt, oddly. 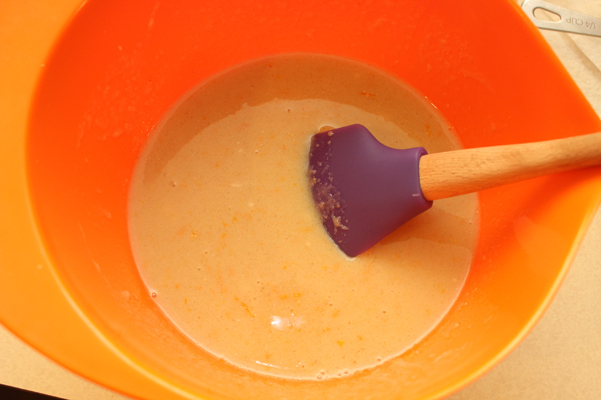 On to the orange bowl, which I filled with milk, brown sugar, yogurt (skipping the “non-dairy” description, as I enjoy my dairy), applesauce, canola oil, and orange zest. At the last minute, I also threw in some vanilla. Okay I’m pretty sure I see an alien in there. Or perhaps just the internal organs of an alien, a wee one. Whisking made it go away. And then, as is the traditional step in muffin-making, I poured the contents of one bowl into the other. 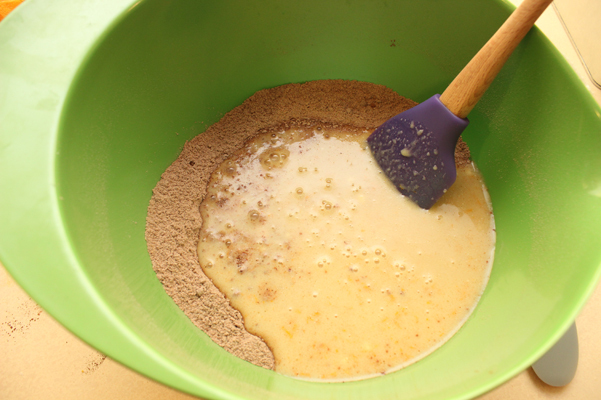 Once I mixed the two, things started looking very, very delicious. 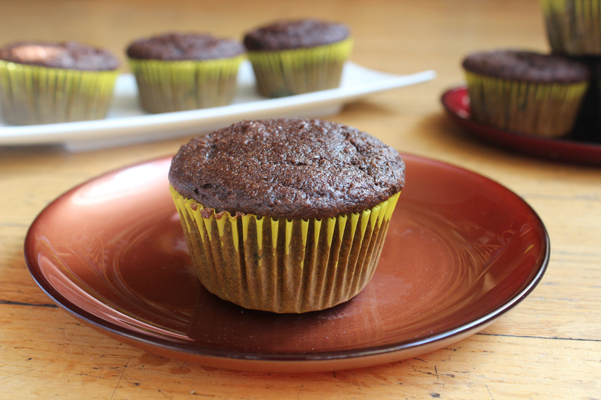 I scooped the batter into muffin cups and briefly contemplated sprinkling turbinado sugar on top. I refrained. I had a feeling these had enough flavor without it. I put them in the oven and started checking 15 minutes in. It took 20 minutes for them to bake through. 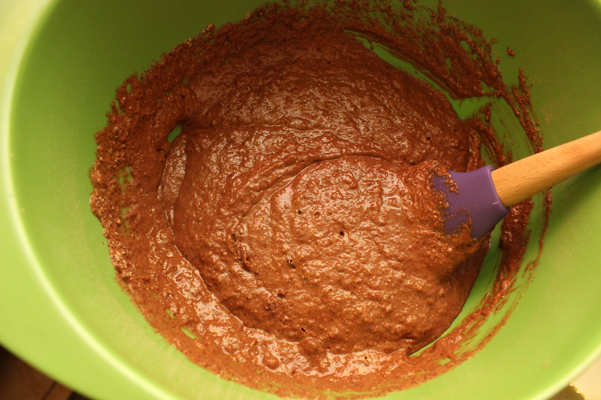 I admit that baking with cocoa powder always makes it a little harder to know when baked goods are done. The standard method is to insert a toothpick and wait until it comes out clean, but cocoa powder always leaves a little something on the toothpick, so you have to temper your evidence with judgment, as well as some trial and error. I keep waiting for this to evolve into instinct. They looked done, though, and they smelled lovely. I gave them a few minutes to cool, then got them out of the tin. Well as I said, these were delicious. The texture was cakey, fluffy but dense in a light way, if that makes any sense. Initially it was about tasting espresso and then orange, followed up by chocolate, but ultimately it became a new fusion of all three. I needed that flavor burst after my two inadvertent dabbles into the world of blandness. Phew. 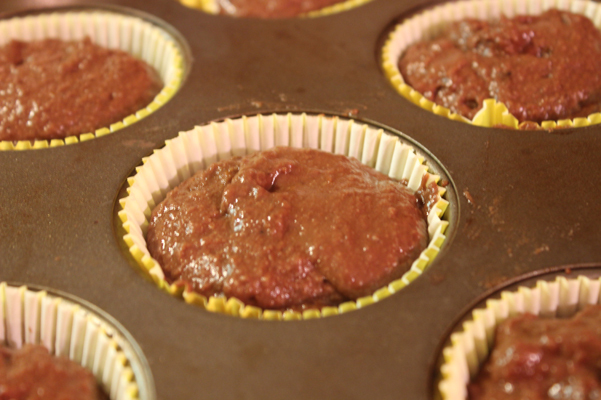 Spray or line a muffin tin and heat oven to 400 degrees. You will reduce the temperature later. 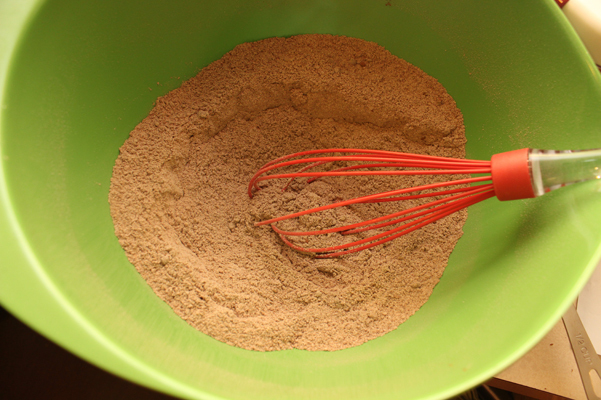 In a large bowl, whisk together the flour, wheat germ, cocoa powder, flax, baking powder, baking soda, and espresso powder. Press out any lumps to get the cocoa and espresso as distributed as possible. 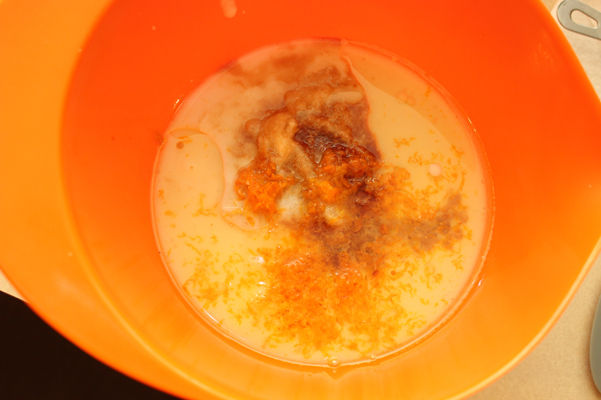 In another bowl, combine milk, brown sugar, yogurt, applesauce, canola oil, orange zest, and vanilla. Stir well, mixing thoroughly. 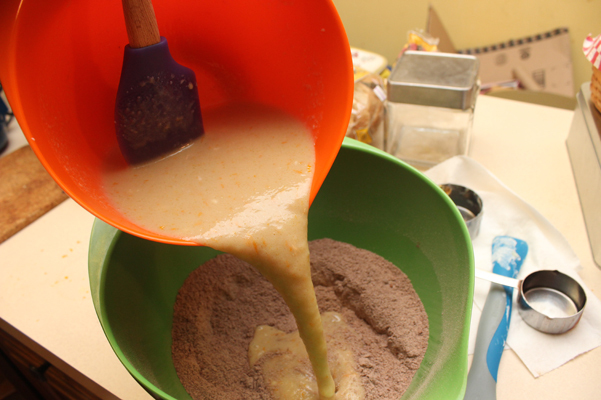 Add the liquid ingredients to the flour mixture and stir just until fully incorporated. 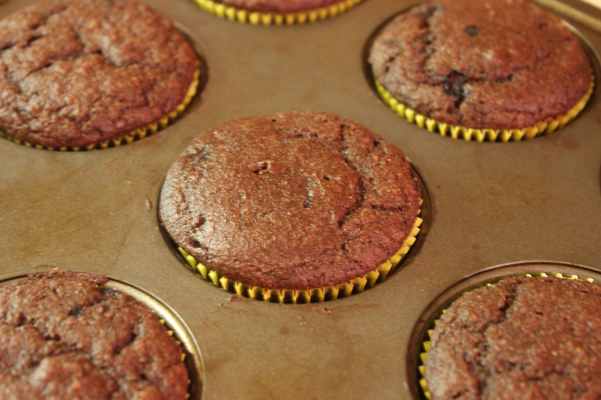 Scoop into muffin tins, and after reducing the oven temperature to 375, bake for 15-20 minutes, or until a toothpick inserted into a muffin comes out (reasonably) clean. 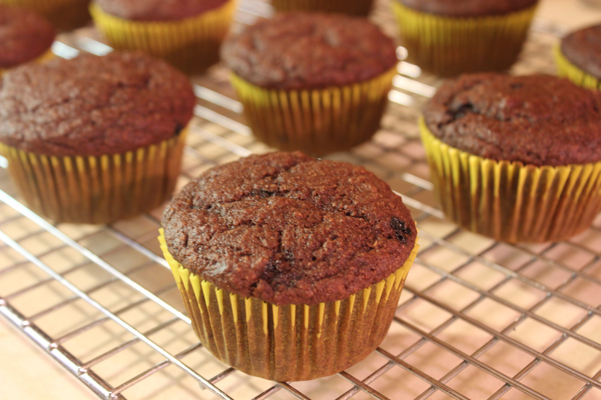 Let the muffins sit in the tin for 5 minutes before moving to a wire rack to cool. These taste pretty good the night they’re baked, but reach a peak of flavor integration and perfection two days after baking. Tracy, the co-worker and connoisseur of Laurie’s baked goods here. These are TO-DIE-FOR, even more so 2 days post-baking. If, like me, you love chocolate, orange, and espresso, then these will be your new favorite sweet treat. I have already put in a request that this recipe make up one of the tiers to my future wedding cake that I have asked Laurie to bake – seriously.